Happy My Birthday to You! To celebrate completing 46 turns around the sun — and the fact that I recently finished a new song I’ve been working on — I made a little video for you with my ukulele. The story behind the song: I’ve been thinking a lot lately about how much energy in my life has been thrown down the tubes, totally wasted on obsessing over my appearance. I was engaged in a vicious war with my body for way too long, and I often wonder what I might have accomplished if I had instead channeled that energy into creative production. Ah, well. Correct forward, as they say! And use humor as a tool to hopefully help other women to get off the obsession treadmill and correct forward as well. If this song speaks to you, please forward it to a friend and/or share on social media. I have a vision of all women turning our energies away from warring with our bodies and towards creating something of value. Truly, we’d be unstoppable. In my last insiders newsletter (not a subscriber? 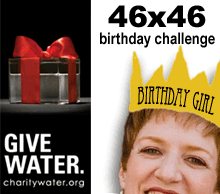 sign up using the form at the upper right), I mentioned that I was feeling kinda bummed out that I have not come close to reaching my 46×46 birthday campaign goal, to raise $2,116 for charity: water. I’d already lowered my goal from $10,000 when I realized that there was no way I could keep my commitment to end my workaholism if I tried to run a $10,000 fundraising campaign on top of all the other Very Big Projects I had on my plate. Every day I get up and look out the window, and something occurs to me, something always occurs to me. And if it doesn’t, I just lower my standards. So here we go, then: Done it! It’s quite an interesting contradiction: I’m still continually pursuing excellence, but at the same time, I’m learning to lower my standards and allow myself to be imperfect, so that I can put myself out there, try things, make mistakes, learn, improve, and put more of my imperfect self out there again. And, as you may have gathered from the ironic message of my song above, I’m learning to accept and truly love my body in all its glorious, aging imperfection as well. What might change in your life if you could stop obsessing and truly accept yourself the way you are? PS – I’ve got a guest post over at Puttytribe today! The Stovetop Model of Life Design for Multipotentialites. I think you might dig it. Click here to check it out. PPS – Pssst! Know someone who might benefit from seeing this today? Pass it on! This is Part 2 of a 3-part series on my 10 Rules for the Creative Sandbox. 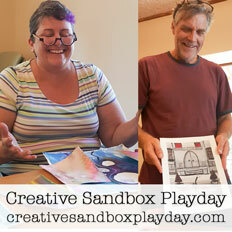 The Creative Sandbox is that space of flow, experimentation and play that, as a creator, I most long to be in. It’s where you lose yourself while finding your joy, and after early childhood, it can be a hard place to find. In my journey toward living my most creative life I’ve found 10 “rules” that have served me well, which I share with you in this series. Read the full introduction here. Which also means there is no “right.” This is play, remember. The point is simply that you’re having fun. 2. It doesn’t matter if you like or hate the product; all that matters is joy in the process. There’s time enough later for editing and crafting. Creative Sandbox time is all about letting your 4-year-old out, and 4-year-olds are much more interested in the experience of creating than in what they make. If this concept is a tough one to wrap your head around, think sand castles, which will be washed away at the next high tide. Let yourself get your hands dirty (literally and/or metaphorically) and simply enjoy the work itself. 3. Think quantity, not quality. If #2 above has you stressing, worried that you’ll never master your craft if you let yourself muck around like a 4-year-old, let me assure you, as long as you aren’t being sloppy, if you take care of the quantity, the quality will take care of itself. All those on the left side of the studio, he said, would be graded solely on the quantity of work they produced, all those on the right solely on its quality. His procedure was simple: on the final day of class he would bring in his bathroom scales and weigh the work of the “quantity” group: fifty pound of pots rated an “A”, forty pounds a “B”, and so on. Those being graded on “quality”, however, needed to produce only one pot—albeit a perfect one—to get an “A”. Well, came grading time and a curious fact emerged: the works of highest quality were all produced by the group being graded for quantity. It seems that while the “quantity” group was busily churning out piles of work—and learning from their mistakes—the “quality” group had sat theorizing about perfection, and in the end had little more to show for their efforts than grandiose theories and a pile of dead clay. 4. Think tiny (and daily). One way to make sure you’re focused on quantity rather than quality is to keep your investment in any single piece of work really, really small. After years of meticulously-made commissioned artworks, each taking anywhere from 30 to 250 hours to complete, I determined to dump the perfectionism and focus on cranking out as many finished pieces as possible. I wanted to be like the quantity group in the ceramics class, dammit, and in order to do that I needed to change my working style so that I wasn’t spending dozens or hundreds of hours on each piece. I was inspired by one of my ArtEmpowers interviews, with daily painter Carol Marine, who found her flow (and a sustainable living, to boot!) when she switched from ginormous canvases to teeny, tiny ones — usually no more than 4-6″ square. When finishing a piece doesn’t require a huge time investment, it’s a lot easier to let go of perfection and just “crank ’em out,” like the quantity group in the ceramics class. If you’re a painter, try working small. If you’re a writer, commit to a small word-count, maybe 500 words, or even 3 minutes of writing. 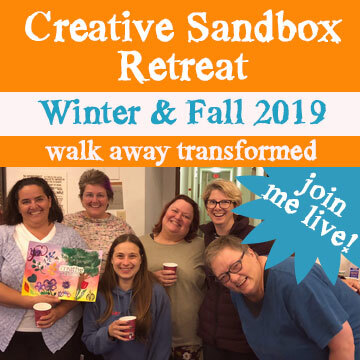 Whatever your creative expression, I recommend keeping your Creative Sandbox time commitment really tiny, too, but consistent — daily, if at all possible. 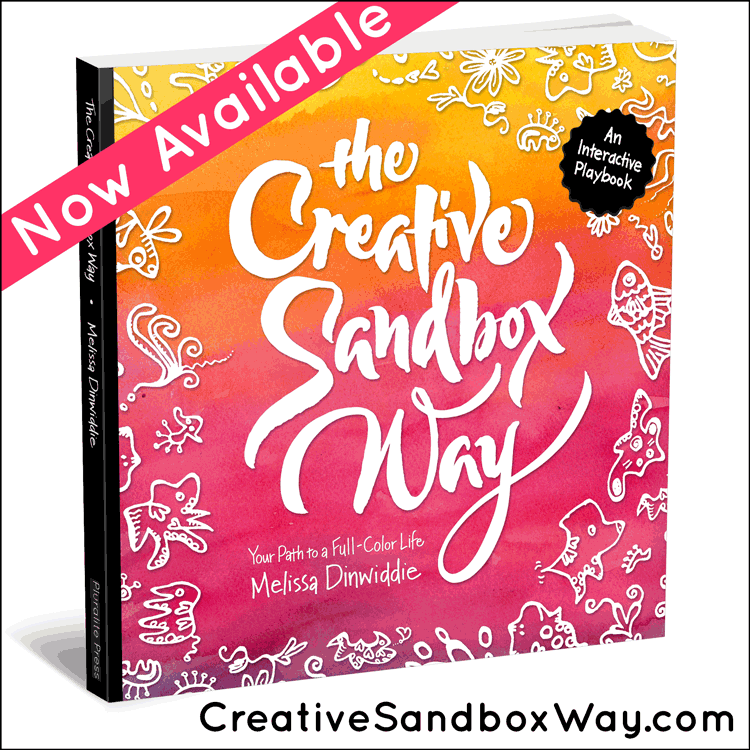 When I started playing in the Creative Sandbox I committed to 15 minutes a day — that’s all. What I found was that 15 minutes was enough to get me into that blissful state of flow, where I forgot my ego for a time. 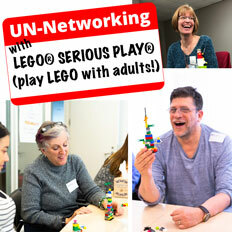 It also frequently led to a Creative Sandbox session that lasted for much longer than 15 minutes. The hardest part, after all, is starting — once you start, it’s usually pretty easy to just keep going. 5. If you don’t know where to start, start anywhere. Many times in my life I’ve had serious creative blocks, including two dark periods that each lasted over a decade. Each time I’ve feared that I’d permanently lost the ability to be creative. 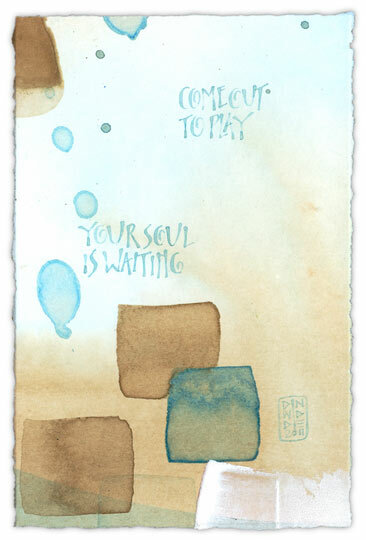 And each time I discovered that the secret to getting those creative taps to flow again is simply to do something. Anything. Just as you can’t theorize your way to a perfect pot, you can’t intellectualize your way to creativity — it requires action. In 2010, when I determined to start making art again, I was burned out on my old, meticulous style of working and decided to try playing with canvas, which I’d never really used before. But I had no idea how to paint on canvas. I’d never used acrylic paints before. I bought some small canvases at an art store, but it took months to work up the courage to open them up. Finally, with the intention to stay in the Creative Sandbox, firmly focused on process, I pulled out my paints and brushes and started making messes. I didn’t much like the products of those first efforts (see #2 above) , but I had fun making those messes. And the best part: within 2 or 3 days, ideas were flowing and I couldn’t wait to get into my studio each morning to try them out! Really, if you just start — anywhere — you’ll be surprised at how quickly you creative juices get going. Sign up here to get my blog posts right in your inbox. Sign up here to get my insiders newsletter, plus my 3-day Creative Ignition Challenge mini-course. Each newsletter links to the latest posts on the blog, but you won’t get the posts themselves in your inbox unless you sign up at the link above. In just six days, on November 5th, I turn 46 (! ), and I want to give YOU a present! I’m giving up my birthday for charity: water, to bring clean water to people who desperately need it. Instead of presents, I’m asking people to donate to my 46×46 Birthday Challenge. Imagine if you had to walk for hours to get water to drink, wash and cook with every single day, and instead of a fountain or tap, what you found at the end of your walk was a mud hole. That’s reality for millions of people, and it’s a big problem. Diseases from unsafe water and lack of basic sanitation kill more people every year than all forms of violence,including war. And think of all the time and energy the goes to hauling water (usually women and children) that could be spent in productive ways! My goal: to raise $2,116, or 46 x $46 — enough to bring clean water to an entire community of 110 people. You can help me do it! Click here to check it out and help make a difference in people’s lives. All of the proceeds from my Indiegogo campaign go directly to charity: water, and they’ll put every single penny to work on actual water projects (NOT to administrative overhead). Plus charity: water will even let us see the real people whose lives are touched by our dollars. Help me turn my birthday into a lifesaving reason to celebrate! Part Four: Support from Unexpected Corners, and Finally In the Studio! I’d done my homework: thanks to suggestions from friends I’d met at Music Strategies, the email I sent to my fan base included links to a web page tricked out with PayPal buttons for donations and pre-orders. I have a modicum of html skills, and thankfully PayPal makes it super-easy to make a “buy now” button, even for a non-techie. I also offered people the option of sending a check, calling me up with a credit card, or giving cash if they preferred (which turned out to be very wise), but I wanted to make it as easy as possible for people to donate on impulse! Would people contribute? My guitar teacher, Carol McComb, had raised an unbelievable amount for her CD 10 or so years back, but I think her list of (incredibly loyal) students was a lot bigger than my list of fans (about 500 strong), and being a performer with an erratic (to put it mildly) gig schedule, rather than a performer and teacher with multiple ongoing weekly classes, meant that I didn’t have quite the loyal following that she did. And then there’s The Economy… I knew I wasn’t the only one with a lot less disposable income to play around with these days.. Was my whole idea just completely crazy? Then lo-and-behold, 52 minutes after sending my email my first contribution rolled in, for 100$! Talk about validation. Especially validating, and surprising, was that it was from a friend from the calligraphy and book arts world, Carol, who has never seen me perform, and whom I hadn’t seen in more years than I can count. Within 24 hours, I received eight donations and pledges, to the tune of $285. Not a bad start! Now that money was actually coming in, the pressure was on. This CD project was becoming more real! I was going to have to deliver a CD, and one that would, I hoped, satisfy all of my contributors! My first recording session was scheduled for December 21, and as the date drew nearer and friends left and right were catching colds, I felt as if I were holding my breath, praying that I would stay healthy. I recorded myself singing my songs and playing my guitar and uploaded these “scratch tracks” to a page on my website and sent the link to the guys in the band so they could get a (rough!) idea of what we’d be recording. The morning of the 21st I packed up charts of all my songs and drove an hour to my drummer John’s garage studio, Idea Room, in Concord. John spent the next hour setting up mikes and plugging in cables until the tiny space was a tangle of black cable. With a drum kit, an upright bass, an electric keyboard, music stands, mikes and various large boxes of sound equipment, I had about a 2-foot square space to stand in. The four of us were in a for a long day of very intense work, in very close quarters. And honestly, I can’t imagine much that would be more fun! After much fussing with cables and computers on John’s part, we all had big (tight!) earphones on, through which we could hear everyone: John’s drums, Doug’s bass, Jake’s keys, and my voice. We spent a few minutes on sound checks, trying to get the mix right in the earphones, so everyone could hear themselves and each other. After all the sound checks were done I pulled out my charts and we started practicing. We hadn’t met to rehearse, so this was the first time the guys were playing my songs. Being the consummate professionals that they are, however, they took my ideas and ran with them. Until that moment my songs had mostly lived as ideas in my head. I played them in my living room, but (inexpertly played) acoustic guitar and voice give a completely different feel than a full jazz trio! I can’t tell you what a delight it was to hear a band bring my music to life! And the guys had fantastic ideas! It was like being in a creative stew pot, with ideas popping up like dried corn kernels in a hot pan. Over the course of our two studio sessions we worked out intros and endings, where breaks would come in the music, and what kind of groove each song should have. Doug started playing a “Killer Joe” intro to Online Dating Blues and we all said “let’s use it!”; Jake suggested a straight-8s feel for I Need A Vacation (brilliant); John used brushes to create a mystical, dreamy intro to Geary Street; Jake pumped out a Gospel feel on the keys for Married Men (a hilarious contrast to the content of the song) while Doug created a “overweight marred men in Dockers” solo. I have to confess that there was no point during our 11+ hours of recording over two Saturdays when everyone was 100% happy with his or her performance! If we’d had unlimited time I suspect we’d still be working on it today (or at least until we all got completely sick of it! A certain amount of perfectionism is the curse of being an artist and wanting your work to be the best it can be). However, I did not have the budget for unlimited studio time, so (thankfully) we didn’t have that luxury. Instead, we moved on whenever we felt like the song we were working on was “good enough” for the CD. Understand that with four professional musicians, “good enough” is a difficult determination at best, and a little distance can turn something “awful” into “not bad” or even “pretty damn good – hunh!” Jake was convinced he needed to re-do his solo on one of the songs, but when we reconvened the following week and listened again, he decided it wasn’t as bad as he’d thought. Once again I was faced with the question of how to produce the CD. I toyed for awhile with doing a live CD recording concert, reasoning that I perform best for an audience. Plus my radio show was live, and I got a handful of acceptable tracks from that, so surely I could do the same again. Also I could ask for donations in advance and at the door to help cover production costs. Finding a venue I was happy with, and actually making it happen, though, proved harder than one would think. I was blocked again, though I couldn’t say exactly why. Margo, my voice teacher thought I should “do it right” and hire a professional producer. She’d been working with this guy for months, was impressed with the performances he was getting out of her, and I figured why not at least meet him? Though I expected working with him would be pricey. And would I encounter the same issues I had with the first producer? All my concerns ended up moot, because somehow, although the producer in question was apparently interested in meeting me, and Margo was willing to make the hour-long drive with me to facilitate an introduction, nothing happened. Weeks went by, I didn’t follow through, and suddenly I realized holiday shopping season was right around the corner, and damnit, I wanted to get a CD made NOW! No more waiting! It didn’t have to be professionally produced (no matter what Margo said) – my home-burned radio show CD had proven that! Hell, if it was better than my radio show CD it would be a clear win, and for that all I really needed was a way to record me and my band. A year before I’d gotten together with a trio in my drummer’s garage studio (John Lazarus – Idea Room) to rehearse and record “just for fun.” My big goal at the time was to get a recording of my first song, He’s Just Not That Into You, to use as a soundtrack for a video I wanted to make. Now it suddenly occurred to me – DOH! – perhaps the most expedient and cost-effective way to go about this would be to record in John’s studio again. I shot off an email asking if he and his band, The Big Beat Trio, would be interested and available, and how much they’d charge. Within a couple of days I had two five-hour recording sessions scheduled (at $30o a pop; $100 for each musician per session), and two mixing/mastering sessions with an engineer John recommended, Nick at Earhythmic Studio, who only charged $50 per song for both mixing and mastering. Wow! Blocks busted! No more paralysis! I was moving forward! Now, how to pay for this thing.. Although I was doing this on a shoestring ($150 per song is a helluva lot better than $1,000 – see Part 1: Background – but that didn’t include the costs to replicate the actual discs), it was still going to cost more than I had on hand, especially given that this was December, the deepest, darkest depths of cash-flow darkness for my mostly wedding-related art and design business. My estimates were at least $2,000-2,500. I had met artists at Music Strategies who had raised CD production money from their fan base, and knew of still others who’d done the same. Earlier this year I randomly sat next to my guitar teacher, Carol McComb, on a flight. I spent the entire time picking her brain about her phenomenally successful fundraising campaign, which brought in something like $40,000 from students, friends and fans. !!! Carol sent me a copy of her fundraising letter, from the days before everyone used email and paypal. Ah, technology! No stamp-sticking for me: as soon as I’d scheduled the recording sessions I composed an email to my fanbase, using Carol’s letter as a skeleton, asking for their support and offering certain “premiums” for different levels of support. Your name on my website AND in the liner notes, 4 copies of the CD, and a coffee date with me! Your name on my website AND in the liner notes, 6 copies of the CD, and a lunch date with me! Your name on my website AND in the liner notes, 8 copies of the CD, and a date for drinks with me! Your name on my website AND in the liner notes, 10 copies of the CD, and a date for dinner with me! Next: Support from Unexpected Corners, and Finally In the Studio! After my disappointing appointment with the cigarette-smoking producer, suddenly I was saved from researching expensive CD production ideas, at least temporarily, when a promoter I knew hooked me up with a live concert gig on KZSU Stanford radio. It was college radio, with old equipment and somewhat limited production values, but hey, there was a sound engineer, and the gig would be recorded, so voilá, I’d have a CD of me and my band! Nothing fancy, no after-the-session mixing and mastering because it would be recorded as one track, but hell, it would be something. The fact that the gig was LIVE on air (with a radio audience of maybe two people for all I knew [in addition to the four or five in the studio audience], but still…) led to a serious case of nerves (can you say “shaky breath support”? can you say “pitchiness”?). But when all was said and done I came home with twelve tracks, five of which made me cringe minimally enough that I felt not too uncomfortable about turning them into CDs to at least have as samplers. (Can you say “perfectionist”?) When, on a whim, I offered them for sale at a gig, and – gasp! – people started buying them, and liking them, something clicked for me. I realized (and this may seem obvious) that being “perfect,” or at least better than I am right now, or “as good as [insert successful music artist]” is not what it’s about. People liked those CDs because they are authentic expression of who I was in that particular moment. Who knows, maybe the moments that make me cringe (when my pitch wavers, or my voice blips or wobbles) make some listeners actually like my singing better, because it’s so clearly not canned. No auto-tuning here, baby! This is the real thing! For two years this home-burned disc (which I titled “Melissa Dinwiddie Live from KZSU”), packaged simply in a paper sleeve, was the only CD I had. My voice was evolving, I was beginning to write my own songs, rather than just singing standards, and it was becoming more and more bothersome that my only CD, much as I liked it (especially after several weeks’ distance!) was no longer representative of who I was now as an artist. It really hit home when I started singing my first song, He’s Just Not That Into You, at gigs. Inevitably, people would come up afterwards asking to buy the CD… and I had to tell them there wasn’t one. Ouch! I could hear the lost sale, the “ka-ching” that never was. Oh, the pain! I added another original song, and another, which led to more “can I buy the CD?” responses, and pretty soon it was clear I needed to get these songs recorded and catch those listeners before they got away! Let me take a moment to rave about a music marketing seminar I’ve attended (three times), because it played a great part in my getting this CD made. Music Strategies is put on by independent music marketing guru, Tim Sweeney, to give independent music artists the tools to make a living from their music without being dependent on a label, or anyone else for that matter. In addition to giving the lowdown on the industry and how it works, Tim teaches you to think outside the box, to be creative about how you market yourself, and to work together with other artists. With that in mind I decided to include only original material on my CD (written by me and/or the talented Angus Stocking), six tracks in total. I’ve been singing jazz since 2005, gigging since 2006, and everyone knows the currency of the music world is recorded songs. Having a CD – and ultimately a catalogue of CDs – along with the downloadable mp3s thereof, is essential to develop an audience. Although CDs are becoming less important in the world of downloads, ipods and music-by-subscription (Rhapsody, et al), it’s still useful to have physical “product” to sell at gigs, give out to potential venues, etc. Perhaps in the not-too-distant future CDs will go the way of the woolly mammoth, but for now they still have their place in the indie music artist’s patchwork quilt of income streams. Naturally, I’ve been wanting a CD since I started singing seriously. What music artist doesn’t have one?? Even just a demo of a few songs is a big step up from nothing – potential venues and private clients need to hear a band before determining if they want to hire them, and they’re unlikely to come to a gig. Plus the days of the homemade cassette tape are long gone. The advent of high quality home-studio recording equipment and software means that it’s now possible for indie artists to achieve professional results without the help of a major label or a rich producer. The catch is you still have to invest money (and if you’re doing it all yourself, significant amounts of time) to acquire and learn how to use the equipment! Still, small recording studios, engineers and home-based producers abound, so one doesn’t have to do it all oneself. Perhaps it is this plenitude of possibilities that had me blocked for so long around making a CD. Certainly the fear of taking a permanent snapshot of my still-developing singing skills had no small part in the blockage. When improvement is clearly evident (to me, at least!) over a period of weeks or months, there’s a strong impulse to wait “until I’m better” to capture oneself for the world (I wish) to hear. But of course, presumably, if one is working on one’s craft, one is continually improving and getting better, so at some point one has to just dive in and accept that any recording is “a snapshot of where I am at this particular moment.” It helps to assume that any given snapshot will only be one of many… but you’ve got to start with one. Hurdling this emotional block was just the start. Once I’d decided that I had the psychic strength to intentionally create a permanent record of my imperfect self, I still had to figure out how to make it happen. I read an article recently which argued that too many choices is actually a hindrance to happiness. I’m inclined to agree. Not that I would want to live in a restricted world, but an overabundance of choices can lead to overwhelm. Which one is best? If I go with A, will I later regret not going with B? Everyone has an opinion, too, a studio “you really must use,” a producer “who’s the best,” a sound engineer… I tend to be of the “research everything to death before making a decision” variety, so the plethora of possible solutions only added to my paralysis. On the suggestion of my voice teacher I did finally make an appointment with a producer, but he wanted to use his musicians, rather than the guys I’d worked with and was comfortable playing with; wanted me to record over canned tracks, rather than live with the band (which, granted, allows for significantly greater editing control, since I could re-do my vocals as many times as necessary to get a good take without also having to get good takes from piano, bass and drums at the same time, but eliminates the in-the-moment interaction among musicians that, as a jazz singer, is part and parcel of what I endeavor to present on stage); was going to charge $1,000 per song (ouch); and (the nail in the coffin) smoked like a chimney, IN the studio, so the place reeked and I simply didn’t think I could tolerate even one hour in there, let alone the seven or eight that a recording session might require. So there went that idea. Back I was at square one. One of the valuable things I’ve learned in the past decade or so is the concept of good enough. As a native of the Land of Perfectionism, this lesson did not come easily. “Good enough” always seemed to me a poor excuse, a euphemism for mediocre, so-so or downright lousy. Making a living as a calligrapher helped cure me of such nonsense. The fact is, if you want to make a living at something like calligraphy, you have to let go of the idea of perfection, otherwise you’ll spend 5 hours on one $3 envelope, which is just not going to pay the rent. You have to learn to accept good enough. Last fall I took on a big project I’d been wanting to do for years: producing a CD of my music. I’d been stuck for the longest time, for lots of reasons, but largely because I didn’t have the money. Jazz singer friends were putting out CDs that they’d spent $8,000, $10,000, $20,000 on, and I just didn’t have that kind of wad, nor did I have a patron willing to play Executive Producer and give me that kind of wad. So I’d go out on my gigs, and sing my songs, and every time, people in the audience would come up to me, eager to buy my CD. And I’d have to tell them that no, there was no CD. Eventually, something snapped, and I decided to hell with it – I was going to make that damned CD if it killed me. No, I couldn’t do it the way I really wanted, but if I wanted to do it at all, I could figure out a way. I could make a good enough CD. Which, after all, is better than no CD! So I called three of my favorite musicians and asked how much it would cost to hire them to play for a couple of sessions in the drummer’s garage studio. And after crunching the numbers for paying the musicians, mixing and mastering, and getting the CDs pressed, I figured that if I did a really quick-and-dirty, live-in-the-studio recording, after all was said and done I could get 1,000 CDs for about $2,000. Which I totally didn’t have. But, I knew other artists who’d raised funds from their fan base, so I emailed my mailing list of about 500 people, and told them I was self-producing a CD and asked for their help. And within a month I’d raised almost exactly $2,000. Now $2,000 for a CD is dirt cheap. It meant just one or two takes of each song. It meant a garage studio with no isolation chambers, so no overdubbing bad takes. It meant I had no other option but to accept good enough. And you know what? I’m actually grateful for these limitations. Because the fact is, without them I’d still be working on that CD, like so many artists I know who’ve been working on theirs for years. Am I totally happy with my CD? I’ll be honest: parts of it make me cringe*, and I wish I could redo them. But I’m damn proud of it. And I’m proud of me for putting out a good enough CD, rather than staying in stuckness and still not having a CD at all. Now I find myself in this new world of words and ideas and blogging, and butting my head into this whole good enough concept on a practically daily basis. And if nothing else, blogging is providing me a great opportunity to exercise my ongoing practice in learning to accept good enough. Which is, perhaps, a good enough reason to keep doing it. *Truth be told, I burst into tears when I brought the master to my vocal coach, because I didn’t think one of the tracks was good enough to put out into the world. She listened to it, and told me I was insane and should go home and get some sleep. Reality checks are wonderful things. Click here to hear the tracks from my good enough CD, Online Dating Blues (including the one – I’m not telling which – that made me burst into tears).